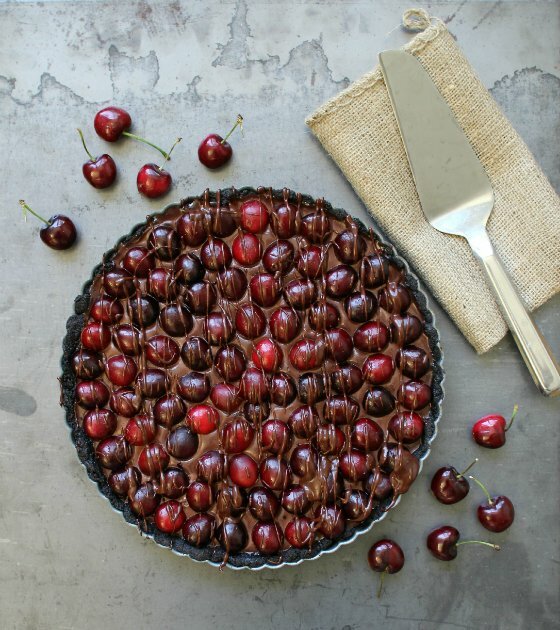 This No-Bake Double Chocolate Cherry Tart is an all-time showstopper! It's easy and delicious. I usually make it for Valentine's Day. Recipe is from Taza Chocolate, my go-to chocolate (Taza 70% Mexicano is always in my desk). Fresh cherries are thee best in this one, but you can always substitute fresh raspberries or strawberries. Process cookies in food processor until fine crumb. Place in bowl and drizzle melted butter over them, and stir to combine. Press into 11 inch tart pan and put in refrigerator to cool. Combine heavy cream and chocolate in small saucepan over medium-low heat and stir occasionally until fully incorporated. Allow to cool slightly then pour into crust. Place pitted cherries on top of tart and let sit for 2 hours or overnight. Drizzle with additional melted chocolate if desired.